This is the kind of dish you curl up with on your window seat, wearing a huge cozy sweater and slippers while you watch the leaves fall in your backyard. Or, for those of you us without window seats (or backyards, for that matter), it can at least make us feel that way while we eat it at our desks as we rush to meet a deadline for our 2:00 meeting. If you look, there are tons of versions of recipes like this. Most are fairly basic – traditional mac & cheese recipe, sub half your cheese with a can of pumpkin, add some nutmeg. The glory of this recipe is that, while I don’t feel ok saying it’s 100% “Figure-Friendly” , it is much lighter than regular mac & cheese recipes. So if you’re having the craving but don’t want the guilt, this is a good recipe to try! 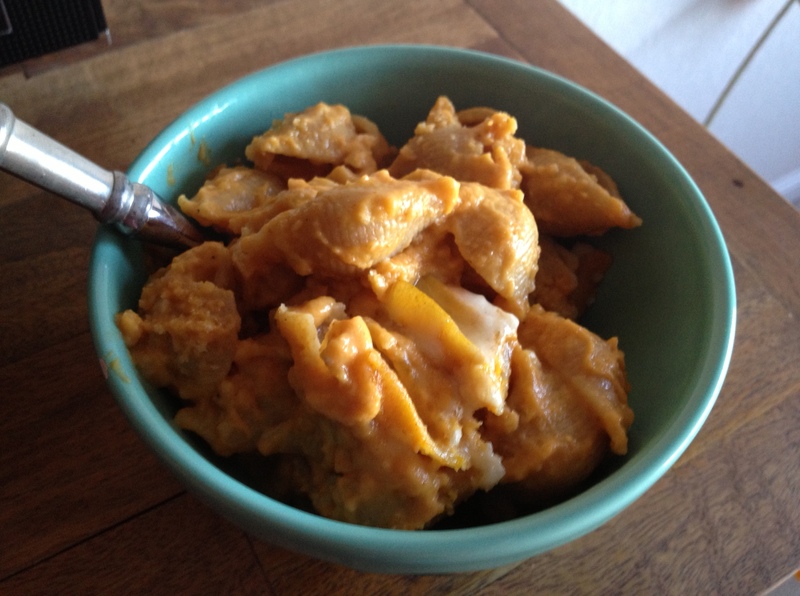 1 can pumpkin puree – not pumpkin pie filling! don’t make that mistake! 1) Cook pasta in salted boiling water. I like to keep it al dente because it cooks a little more in the oven. Whole wheat pasta is good for baked pastas because even if you fully cook your pasta ahead of time, it is less likely to get gooey and sticky in the oven. 2) While macaroni cooks, melt the butter in a pot over medium heat. Let it cook and don’t mess with it too much until it begins to brown. Once browned, whisk in flour until smooth. 3) Continue whisking while you slowly add milk to form a bechamel-type sauce. Season with nutmeg, then add salt and pepper to taste. 4) Keep on with the whiskin’ while you add the pumpkin. Once smooth, add your white cheddar. You will now have an amazing creamy orange sauce that should look and smell like AUTUMN! NOTE: You may need to add a little more milk here if you like your mac & cheese really creamy. I added about a 1/4 cup more, but it’s up to you. Mac & cheese is a pretty personal thing, after all. 5) When pasta is done, drain and transfer to a large oven-safe casserole dish. 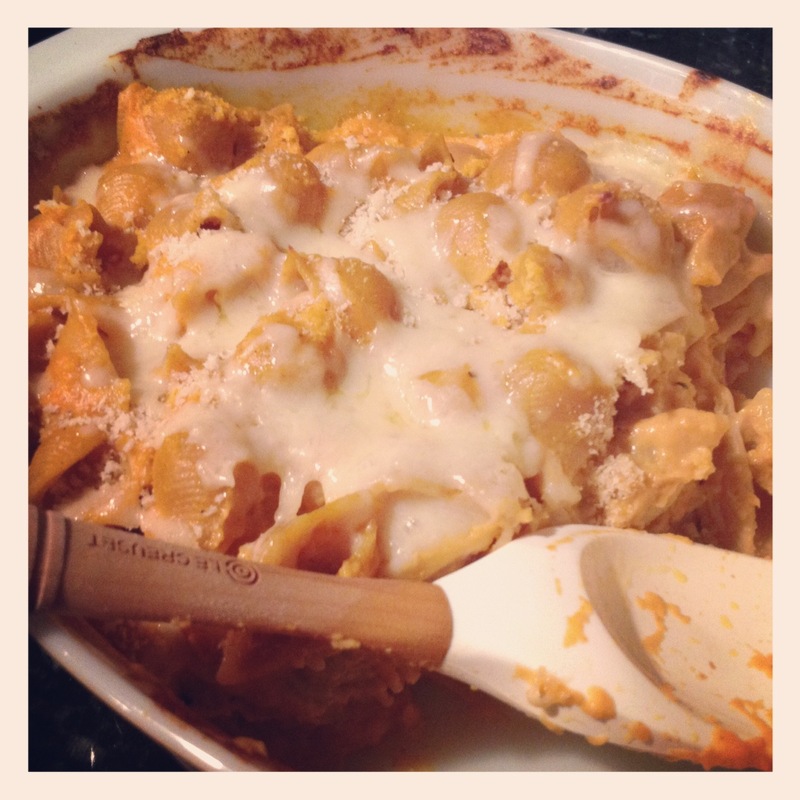 Pour pumpkin-cheese sauce over pasta. Add bread crumbs. Slowlyyyyy and gently mix your pasta so that all of the noodles are covered and sauce is evenly distributed. 6) Bake for 13-15 minutes. Add your extra cheese and a handful more of the bread crumbs, then continue baking for 5-7 more minutes or until top is golden brown and edges are bubbling. Serves about 6-8 as a side, or 3-4 as a main dish. NOTE: This was great when we first ate it, but it was ahh-mazing reheated. I think sitting overnight in the fridge really helped the flavors sink in. So I think if you wanted to, you could definitely make this one day ahead and reheat to serve, it just might not be quite as creamy. 1) If you like it really creamy and you’re just reheating a serving or two, stir in a splash of milk once it’s warm! 2) This would be SO GOOD with some fresh sage mixed in to your cheese sauce, or even throw a few leaves on top to crisp up when it bakes. 3) If you live alone, half the recipe or else you will eat it for every meal for five days straight.